A ride along the coast is always refreshing and rewarding and never fails to delight guests. From Torrey Pines State Beach we ride through the towns of Del Mar, Solana Beach, Encinitas, Carlsbad and Oceanside, each uniquely separated by fresh water lagoons and beautiful coastal views. In Oceanside Harbor we'll stop for a visit before turning and recapturing the coast from a whole new perspective as we retrace the route in reverse. Tony has been my tour guide for several rides around San Diego. He takes the time to plan bike-friendly routes through some of the area's most beautiful places. The Bike Ride San Diego touring bikes are kept in great condition, and Tony helped adjust my bike for a good fit. 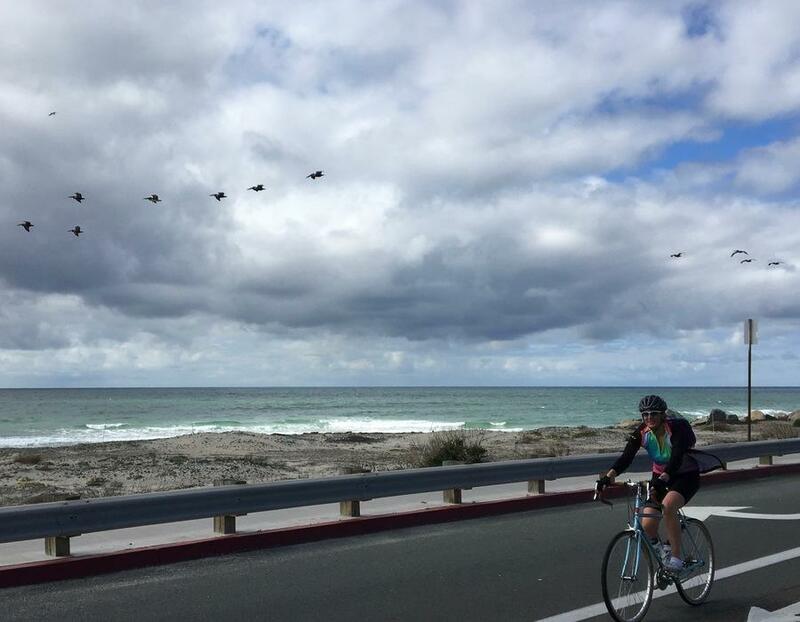 If you want a worry-free ride on some of the best routes in the area, I highly recommend Bike Ride San Diego. This coastal cruise is a slice of paradise in San Diego's most popular cycling environment. But it's not for cyclists alone, it's a mecca for surfers, runners, hikers, and all kinds of beach goers alike. If there is a downside to our beautiful accessible coastline, its attraction to all outdoors lovers who come here to play and that we don't have the roads all to ourselves. We start at Torrey Pines State Beach with a significant climb over Peñasquitos Creek and the Amtrak train tracks before a final bit of climbing gets us to Del Mar. Leaving Del Mar we have a series of rivers, lagoons, towns and coastal vistas that roll as a parade leading us from scene to scene. 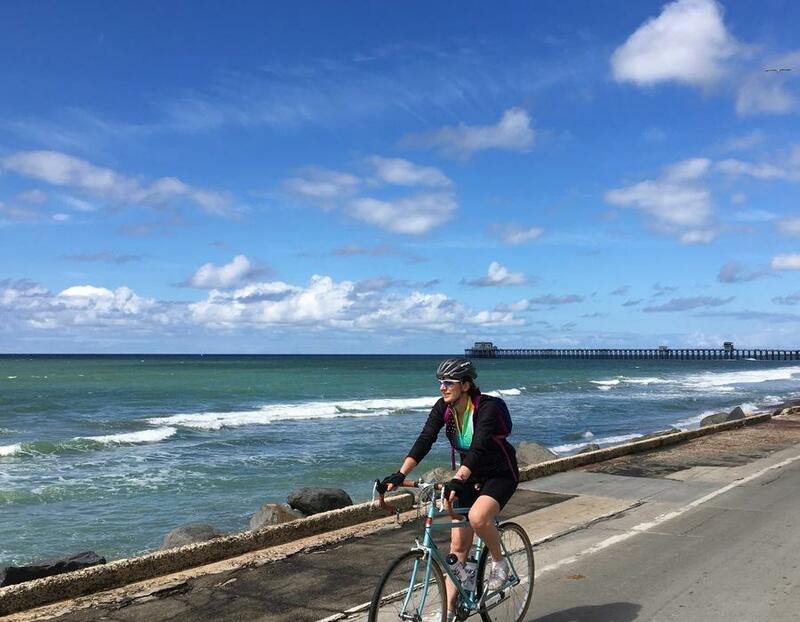 In succession we'll ride through San Dieguito River, Solana Beach, San Elijo Lagoon, Cardiff-by-the-Sea, Encinitas, Leucadia, Batiquitos Lagoon, South Carlsbad, Aqua Hedionda Lagoon, Carlsbad, and Buena Vista Lagoon to Oceanside and the Oceanside Harbor, our turn around point. Heading south we'll see it all in reverse, with the added anticipation of imagining what comes next from a viewpoint that's still closer to the cliffs and the ocean below. We follow nearly the same route back to our starting point, this time however, leaving Del Mar we'll descend that original climb back into Torrey Pines State Beach where the tour finishes. The ride is always fun, always exciting and always a pleasure and all the more so when shared with other coastal enthusiasts who appreciate the beauty of a long coastal cruise. This ride is suitable for a regular cyclist or someone in good general fitness. Following a moderate climb at the start, expect longer flat and rolling sections throughout with light to moderate climbs and descents running in and out of the coastal lagoons. The primary feature of the ride is scenery not gradient, therefore good general fitness is all that’s needed to be able to complete this ride. Because of the length of the route (44 miles) it's best ridden as a faster paced (15+ MPH) open road ride. The ride is not technical except that we ride on roads with traffic. The entire ride is a on bike route with bike lanes or shoulders throughout. Most of the roads are in good condition and we do cross train tracks on one occasion. 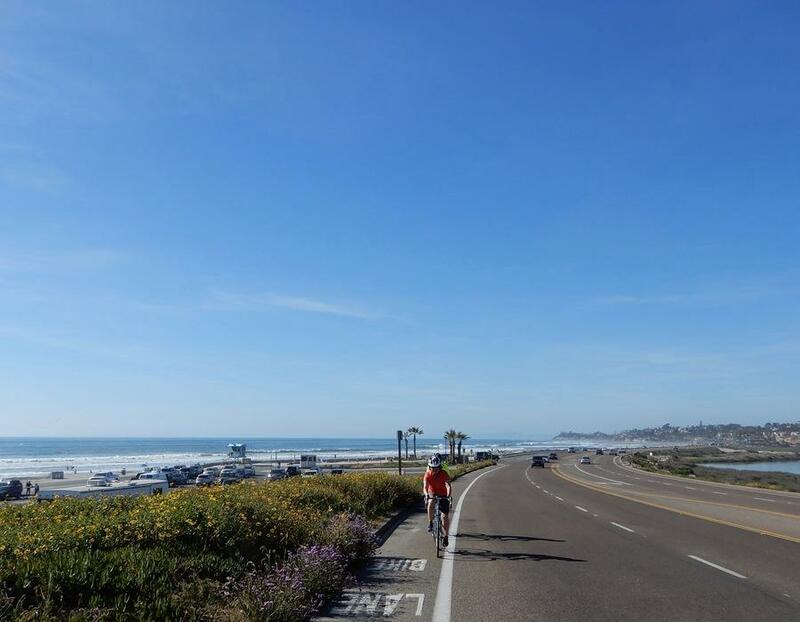 From Torrey Pines State Beach, climb into Del Mar and roll north through Solana Beach, Encinitas, Carlsbad and Oceanside experiencing the coastline that links these communities together. 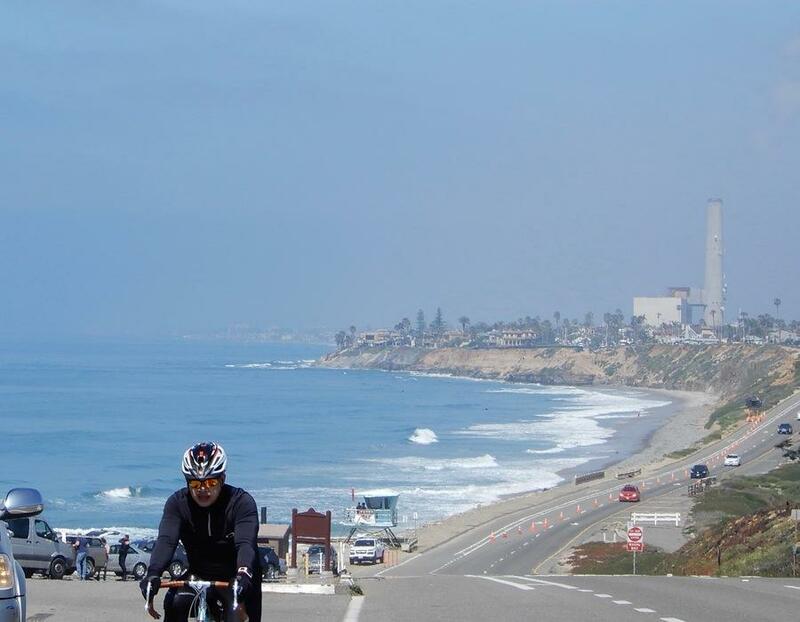 Turn around in Oceanside and enjoy it all in reverse, minus that initial climb into Del Mar. The start time for this ride can be flexible but it works well to start before noon. There are several places to stop for coffee and something to eat if desirable. We will stop along the the route for water and restrooms as needed. 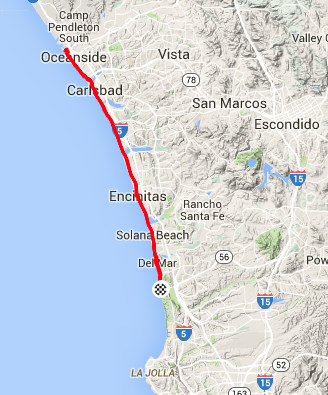 This route works well when starting from other locations near the route along the coast. This route can be shortened if needed.